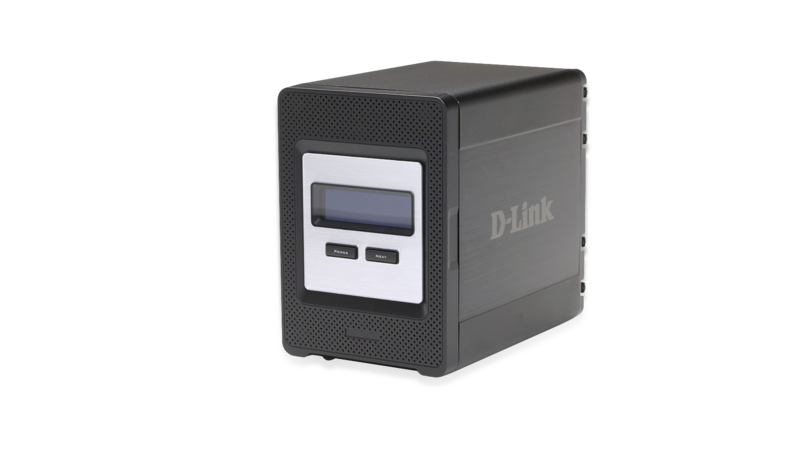 The D-Link ShareCenter 4-Bay Network Storage Enclosure (DNS-343) supports up to 8TB of storage capacity and RAID 5 for efficient data protection as an alternative to mirroring. The DNS-343 features an OLED display, a USB print server and a management interface that allows you to easily set rules and schedules. Hard drives crash. Back up your digital files with D-Link's 4-Bay Network Storage Enclosure and rest easy knowing that your data is protected. 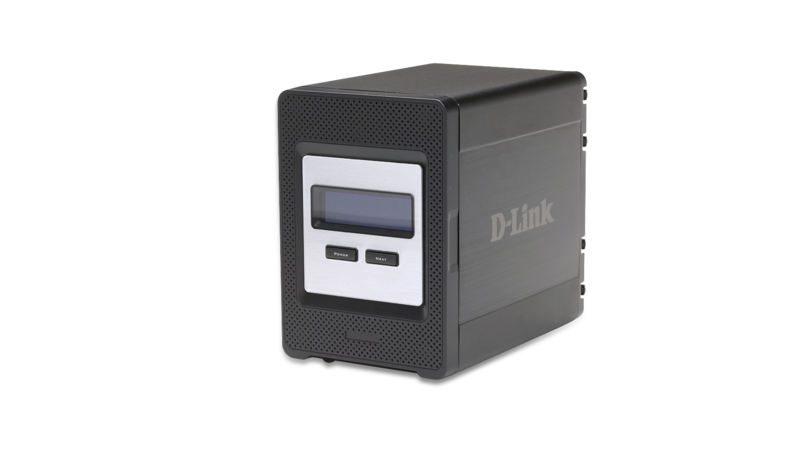 The D-Link® 4-Bay Network Storage Enclosure (DNS-343) is the perfect way to store, share, and safeguard your documents, music, videos, and photos. With the D-Link tool-less installation, you can easily insert up to 4 SATA drives1 without any tools or attaching any cables. Plus, the DNS-343 is a scalable solution, allowing you to start off with one SATA hard disk drive (HDD) and add up to 3 more as you grow. By supporting RAID 0, 1, 5, and JBOD, the DNS-343 gives you a variety of data protection options to help avoid data loss due to hard drive failure. RAID 0 combines all drives in a ‘striped’ configuration, splitting data evenly across the hard drives to provide the highest performance. RAID 1 causes two drives to mirror each other, providing maximum protection. If there are four drives present, you can set up two separate RAID 1 partitions. If one drive fails, the unaffected drive in the partition will continue to operate normally. Once you replace the failed drive, RAID 1 mirroring will resume and both drives will mirror each other again. Advanced RAID 5 offers the highest performance with the most reliable data recovery in the case of a drive failure. RAID 5 technology uses a clever algorithm to distribute your data over 4 SATA hard disk drives and, in the case of a hard drive failure, the DNS-343 will continue to function with your data intact. With the included backup software, you can create schedules and rules including real-time full or incremental backups and storage quotas for specific users and groups. Using backup software, you can automatically back up your data onto the DNS-343, creating a failsafe protection solution from accidental data loss on your PC. 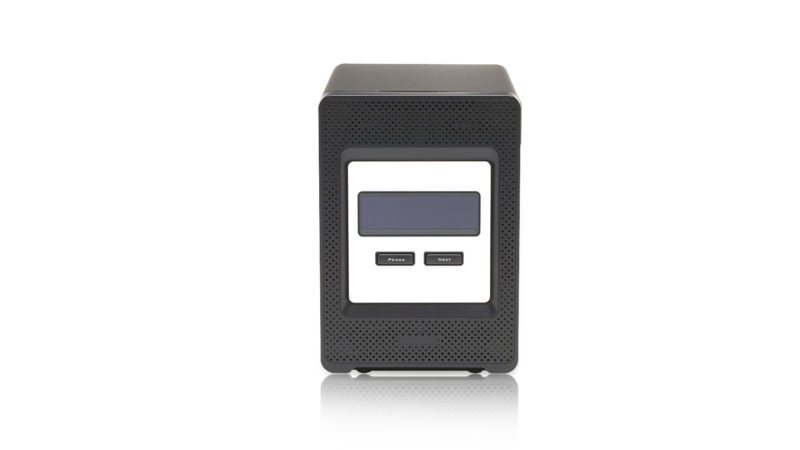 The 4-Bay Network Storage Enclosure features an OLED to display important information including IP address, hard drive statistics, temperature, RAID status, and server status (FTP and UPnP™). The USB port can act as a print server port, allowing a USB printer to be added to your network without the need for a dedicated computer. The USB port can also support a Universal Power Supply (UPS) monitor that supports ‘smart’ signaling over a USB connection. 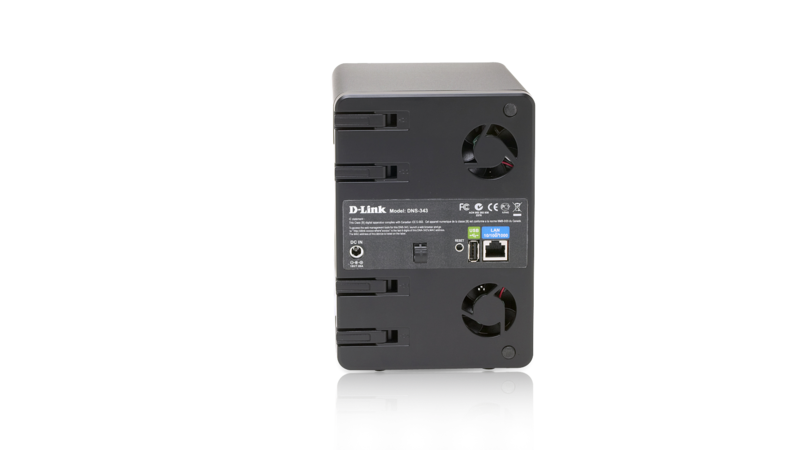 If a power outage were to occur, the compatible UPS monitor would allow the UPS unit to safely shut down the DNS-343. When power is restored, the UPS monitor would then automatically power up the DNS-343. For flexible usage, the DNS-343 includes features such as a built-in FTP server2 to access files over the Internet and a UPnP™ Media server to stream digital content to compatible media players. With RAID 5 technology, an OLED that displays vital storage information, a management program that allows you to easily set rules and schedules, and a variety of built-in servers, the 4-Bay Network Storage Enclosure (DNS-343) is a secure expandable and reliable storage solution for the home and business. The 4-Bay Network Storage Enclosure (DNS-343) enables you to store and access your documents, music, photos, and videos across the network and on the Internet so family members, friends, or employees can access them. You can use this device to stream music, photos, and videos to UPnP™ AV compatible network media players. The DNS-343 features RAID 5 technology, allowing you to securely store data across 4 hard disk drives. If one drive fails, the DNS-343 will continue to function with your data intact. 1. Hard drive(s) not included. An internal SATA drive is required to store or share your files. RAID 5 requires the use of four (4) internal SATA drives. RAID 1 mirroring requires the use of two (2) internal SATA drives. To avoid data incompatibility in RAID 1 and RAID 5 operation, use SATA drives from the same manufacturer. Formatted drive capacity for RAID 1 and RAID 5 operation is dependant on the drive capacity of the lowest-sized drive. May not work with older generation SATA drives. 2. Note that use of an FTP Server to access files over the Internet does not provide for secure or encrypted transmissions. It is recommended that the end user utilize a Virtual Private Network (VPN) to establish a secure FTP session.